Do you want to capture screenshot of main or primary monitor only on a dual or multi monitor windows computer ? The Software presented is a free to try and $5.00 to register software application which can be really helpful when using dual monitor windows computer. Yes there are many features in the software that can be useful for a multi monitor windows computer. In order to capture screenshot of the main monitor only, the Dual Monitor Software provides two options. 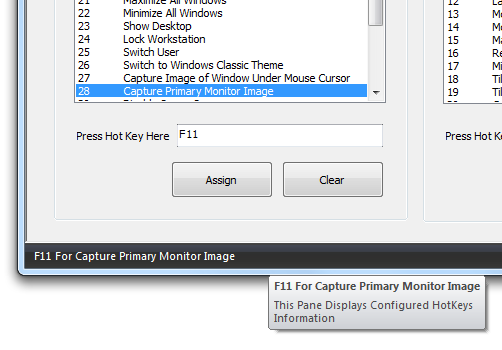 The first option to capture screenshot of primary monitor only is displayed as below. The Screenshot above displays list of shortcuts and one shortcut configured to capture screenshot of the primary monitor only. The primary monitor on a Windows computer is the Monitor on which the Start Menu and Taskbar is displayed in a Windows 7, Windows Vista and Windows XP computers. On Windows 8, the start menu is displayed on the primary monitor, however the taskbar can be displayed on all other connected monitors. The Keyboard Shortcut configured in the software can be used to capture screenshot of the main monitor on all windows versions including Windows 8, 7, XP a, Vista , etc. 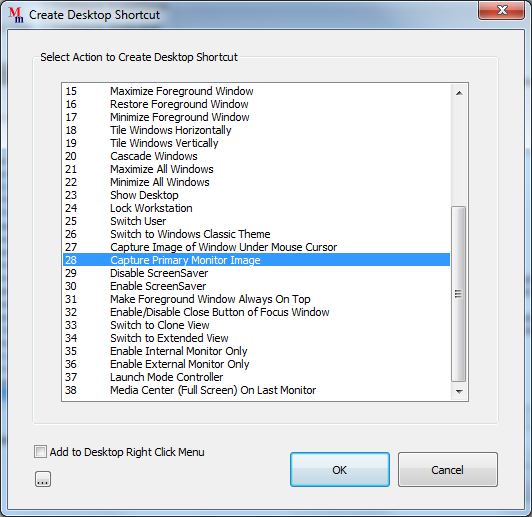 Apart from Keyboard Shortcut, you can also create a desktop shortcut to capture main monitor screenshot on a Multiple Monitor or Dual Monitor Windows Computer. Yes this shortcut can also be added to the right click of the desktop as well. You can also create many other useful shortcuts on desktop to control your dual or multiple monitors as displayed in the screenshot above. The Desktop Shortcut to capture main monitor screenshot can be created on a Windows 8, Windows 7 and other windows versions as well.